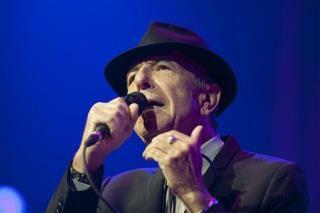 (Newser) – Leonard Cohen is 82 now, and fans will not be thrilled to learn in a lengthy New Yorker profile that he's almost certainly done touring—his body just isn't up to the rigors. But he's still making music, and an album out this month is classic Cohen in that it's "obsessed with mortality, God-infused, yet funny," writes David Remnick. The profile is much larger in scope, however, tracing the arc of the Canadian-born Cohen's life, including his time with muse Marianne Ihlen. And it includes a rare treat: the normally reticent Bob Dylan going into depth on why his friend Cohen is so brilliant. “When people talk about Leonard, they fail to mention his melodies, which to me, along with his lyrics, are his greatest genius," says Dylan. "Even the counterpoint lines—they give a celestial character and melodic lift to every one of his songs," he adds. "As far as I know, no one else comes close to this in modern music."